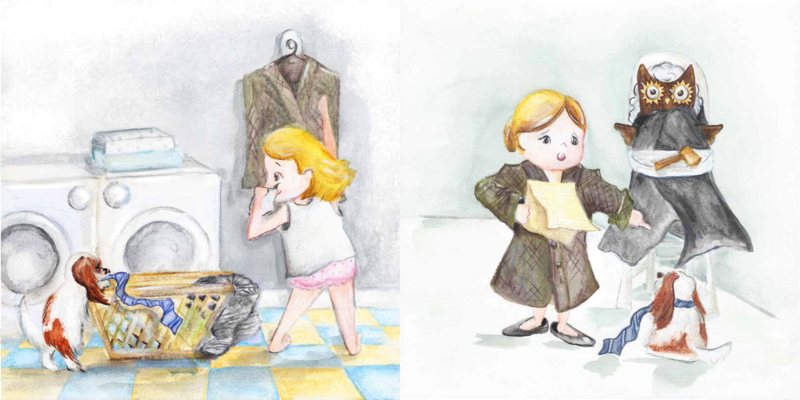 The nameless young girl, along with her loyal puppy, take readers through part of their day as they move from room-to-room, outfit-to-outfit, and activity-to-activity. They start their day deciding what to wear. Deciding to start with some exercise, the girl pulls down her pink tutu, matching top, a violet sash, and . . . wait, what about her feet? No worries, pup has fetched the girl’s pink ballet slippers, dutifully waiting for his friend to slip them on her feet. 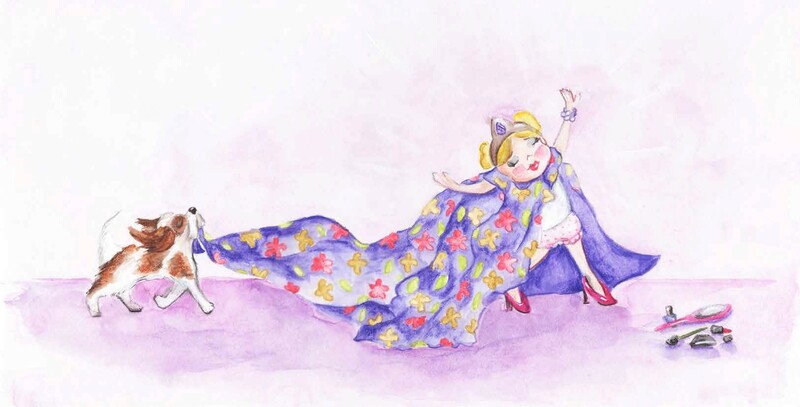 With a high twirl and a long leap the pair dance, never out of step. 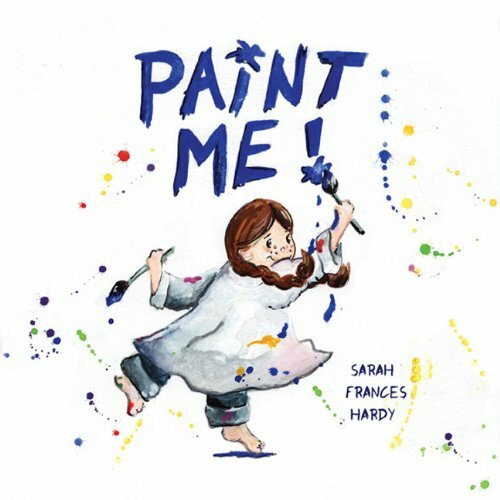 The young girl and her dog take on a gamut of outfits (tutu, smock, scrubs, dresses, and masks), and identities (artist, teacher, lawyer, diva, builder, or plumber), as they dance, paint, fly through the air, and take lunch orders. I like that kids can decide why the girl is teaching, what she is teaching, and to whom she, dong a great job of blending in to the scene. Pup does the same in this scene. 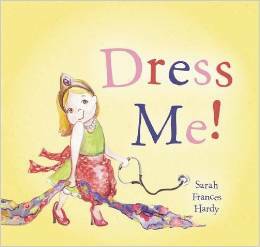 Dress Me will appeal to young girls more than boys, even though Hardy includes male-oriented careers and activities boys enjoy. The illustrations are delightful. Each spread is loaded with detail, adding continuity by carrying items from one spread to the next. For example, the puppy pulls a blue-striped tie from the laundry basket. In the next image he wears the tie while pretending to be in court, on the wrong side of the young girl’s law. She has pushed a pair of glasses atop her head while waitressing and worn correctly as a teacher. 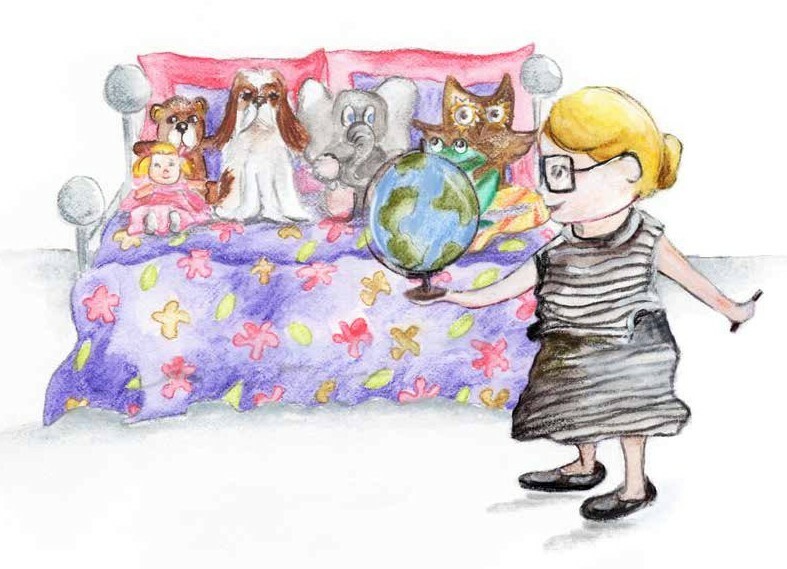 Dress Me is the perfect book for preschoolers beginning to self-explore their world and their place in it. Parents will appreciate the creativity Dress Me can inspire in young girls, who will begin to think out of their prescribed female roles. More importantly, Dress Me encourages young girls to enthusiastically be themselves. A final note: the illustrations are the best yet from Hardy who improves with each book. Dress Me! is Hardy’s third book. Her others are Paint Me! 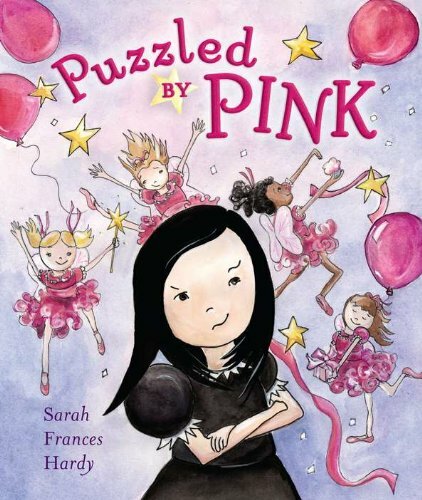 and Puzzled by Pink (reviewed HERE). DRESS ME! Text and illustrations copyright © 2015 by Sarah Frances Hardy. Reproduced by permission of the publisher, Sky Pony Press, New York, NY. Purchase Dress Me! at Amazon —Book Depository—Sky Pony Press. Learn more about Dress Me! HERE. Copyright © 2015 by Sue Morris/Kid Lit Reviews. Maybe in a Dress Me The Sequel it’ll be the doggie that gets dressed up! Yay! The dog does dress up at times. He wears a Halloween costumes and a cape as a superhero pup. But a book of just the dog dressing up would be hilarious. Thank you. It is nice to “see’ you.